at a Transition Oahu potluck in 2012. ShareFest will include "Skill Share" zone where, throughout the day, community members will offer hands-on workshops to anyone interested learning a given skill. Inquiries: If you have a question or idea, contact Dave with Transition Oahu (transitionoahuevents@gmail.com) or Joy with Positive Media Hawaii (http://positivemediahawaii.com/contact-us/). Learn 5 fun and exciting partner yoga/balance moves that build strength, flexibility and trust! Come alone or with a partner. No yoga experience necessary but bases should have strong legs and flexible hamstrings. Flyers need only be willing to trust their base. All fitness levels welcome but please do not participate if you have a back or neck injury. Great for adults and kids! 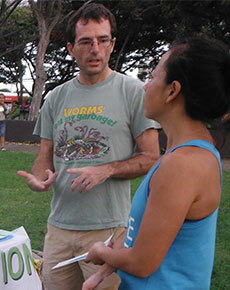 Transition Oahu Board member David Atcheson, a Seattle Tilth certified "master composter / soil builder" and graduate of the Oahu Permaculture Design Course in 2012, will show you how to build a worm bin for use in your back yard or lanai. Participate in preparing the bin and bedding, learn some worm bin dos and don'ts, and see finished vermicompost from Dave's bin (maybe take some home!). Dave can also answer questions on worm bins vs. bokashi buckets. Come learn reflexology, a non-invasive, complementary modality that involves the application of an appropriate amount of pressure using thumbs and fingers on specific points of the feet, hands and ears affecting the whole body. Taught by members of the Reflexology Association of Hawaii – sharing the healing touch throughout the islands. In this workshop, we will build a simple bamboo icosahedron with Julia Teles of Brazil. All people are welcome to come and help and learn a bit about this structure, about bamboo and the lashing. Julia is a PhD student doing and exchange at the UH School of Architecture. She's interested in construction that can be done with natural materials with people working together and sharing skills. * A buffer is provided between time slots to account for transitions between Skill Share sessions. Session length may be customized depending on session needs and availability. Note: There will also be an opportunity to facilitate an informal discussion at a picnic table -- conversation café style. Come with your idea and connect with those who share an interest in your topic or project idea.